AIS children enjoyed hunting for eggs in school and the park to celebrate Easter. 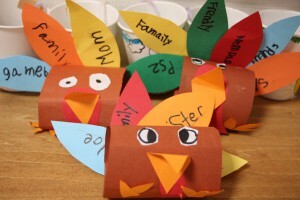 In the morning, the elementary school students also made Easter crafts. 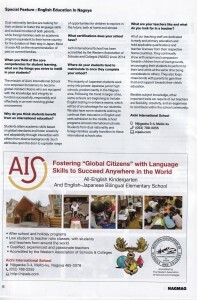 Congratulations to all the new students joining the AIS family. Hello. Konnichi wa. Sa-wat-dee. Ni hao. Anyoung haseyo. Sani bonani. Privet. Namaste. Ayu bowan. Ola. Mambo. Bonjour. Sin chao. Buna Ziwa. 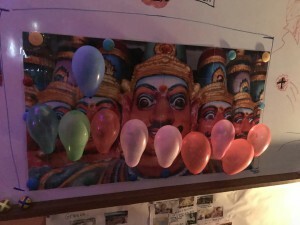 Selama dada. Mustaa. Wah gwaan. Kia ora koutou katao. 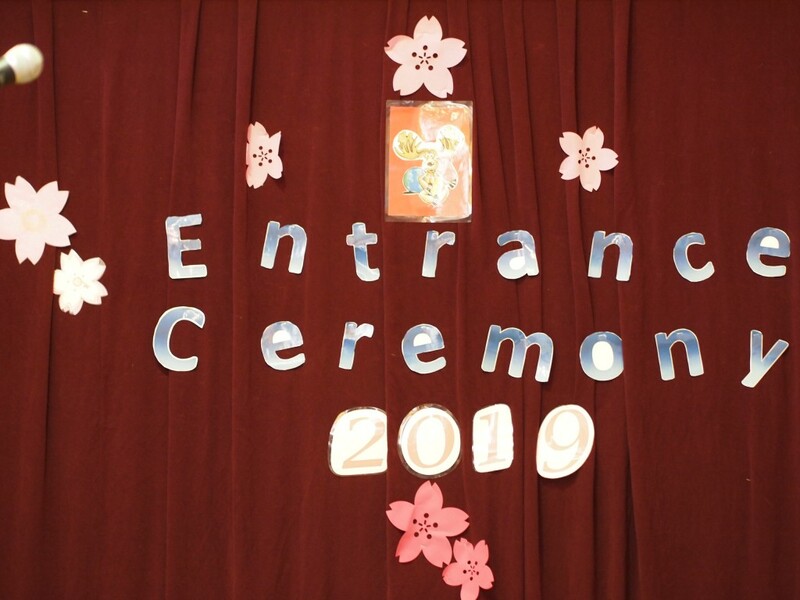 And welcome everyone from around the world to the Aichi International School Entrance Ceremony for 2019. I am Mr. Hill, the Headmaster of AIS and your MC today, which is a very exciting day for all of us. We are excited to welcome in new and familiar faces to our school community, and I can imagine you and your families are excited to begin a new step in your lives. Starting a new school is an exciting time to learn new things, make new friends and begin creating a dream for your future. Together with our wonderful teachers and your caring parents, we look forward to helping you bring out your talent to become the best person you can be. As you can see on the posters on the walls and around the school, we aim for you to use those talents in four key areas: Globally-minded, communication, respect and confidence. Please remember to always keep these in mind every day at AIS. To all parents, thank you again for choosing Aichi International School for your child’s education. 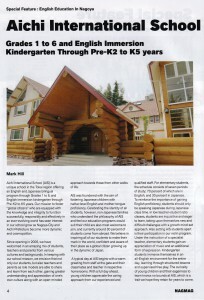 With your cooperation and support, we aim to provide the best education for your child. It is with your show of support towards our school philosophy that your child feels your encouragement and pride in their efforts. Please remember to always pass on to your child the value of your home language to access their own heritage. Praise them for their efforts in using multiple languages, not just focusing on one, and acknowledge the hard work they are doing! Congratulations to the graduating students of Orca and Grade 6. Dream big for the future from the little things each day! Elementary students performed with confidence in the Term 3 violin concert. 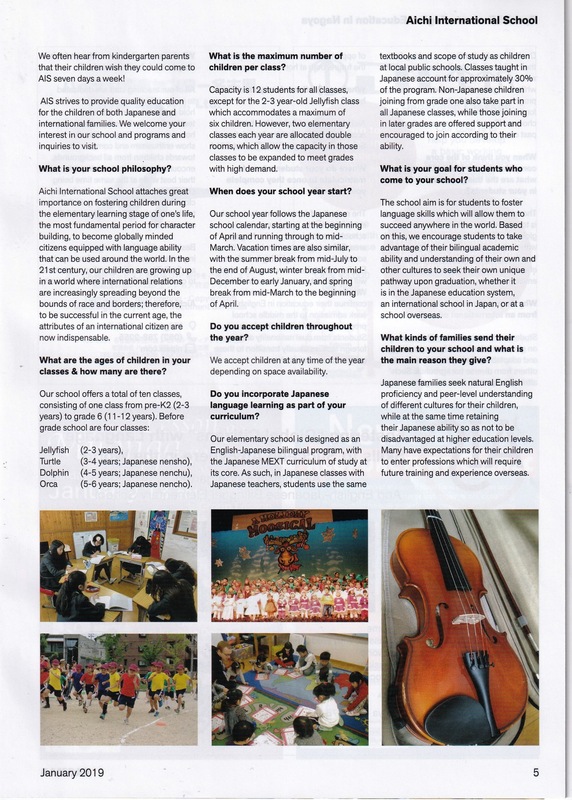 AIS students enjoyed a wonderful performance of traditional shamisen music played by the members of Seiyukai. 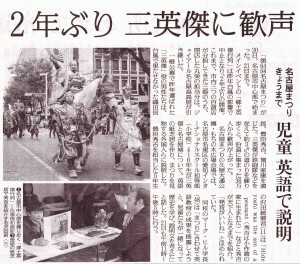 We learned how to sing and dance along to folk songs from Aomori, Hokkaido and Gujo Hachiman. Thank you for a wonderful experience. 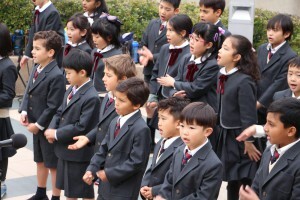 The Jellyfish, Turtle and Dolphin children joined in unison to sing and perform heartily for us. 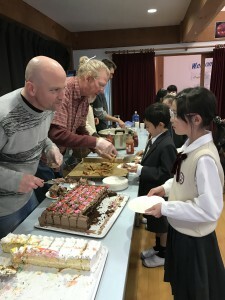 Again this year, the Orca through to Grade 6 children at AIS stepped up on stage and gave wonderful speeches in English. The quality was high this year, making it very difficult for the judges to choose winners. Keep up the great work! AIS students and families were treated to a colorful display of wonderful performances at this year’s talent show. Well done to all who took the courage to get up on stage and shine. 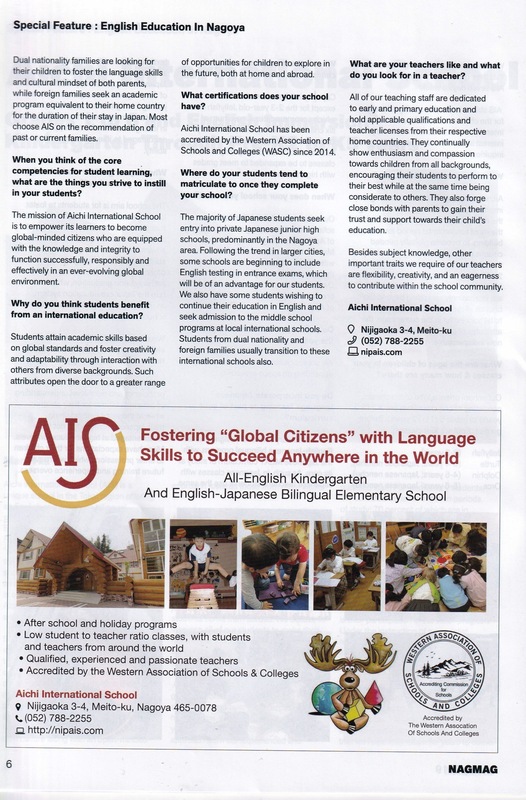 AIS appears in the ‘English Education in Nagoya’ special feature of the January 2019 issue of NAGMAG, Nagoya’s magazine. 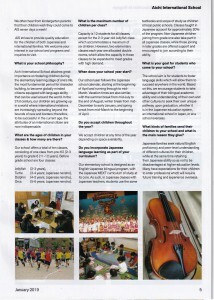 Read the article below and click here to visit NAGMAG. Best wishes for a happy 2019 everyone! 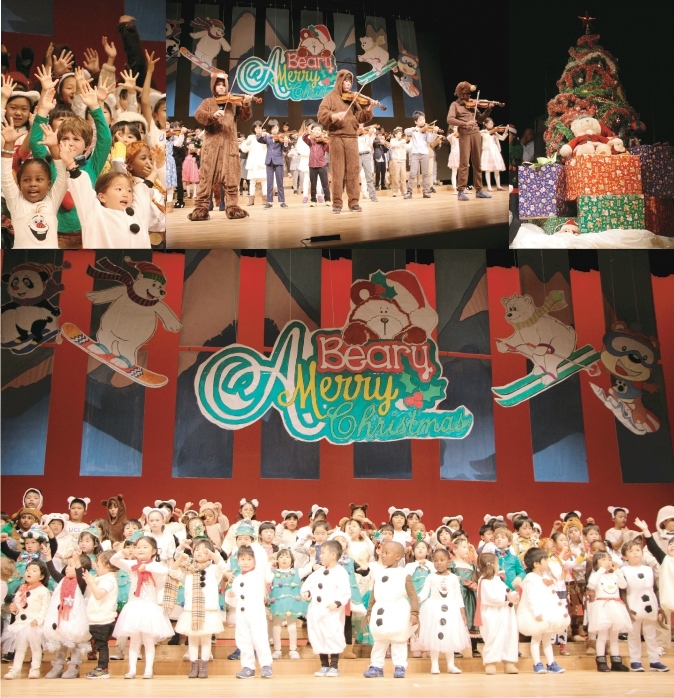 AIS held its ‘Bear-y Merry Holiday’ theme Christmas concert last night. The students from kindergarten and elementary put on a wonderful performance for all. 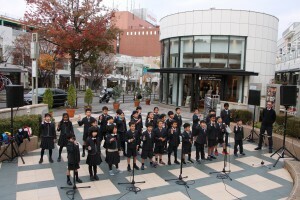 Elementary students from AIS performed some songs for the public from our upcoming “A Bear-y Merry Holiday” Christmas concert. Thank you to all those who came along and gave your warm support. We hope you enjoyed the performance. 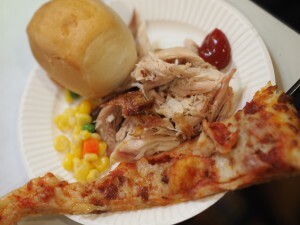 To celebrate Thanksgiving at AIS, all the students enjoyed a scrumptious meal of chicken, pizza and cake in the hall. 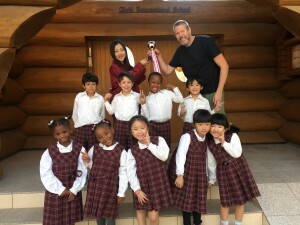 November 2018　Orca Class Unstoppable in Soccer Cup Win!!! 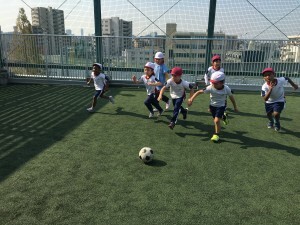 AIS won the Child Academy Kamiyashiro Daycare soccer tournament for the first time in 6 years!! 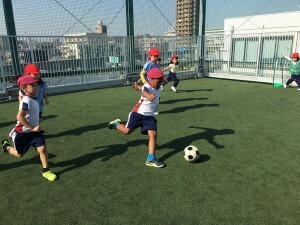 Thanks to JJFC Coach Takeuchi who provided a wonderful soccer session before the summer vacation and hearty practice over the past few weeks, both AIS teams made it all the way to the final, with the Sharing and Caring Orcas taking a 1-0 win over the Super Soccer Orcas. Well done, champions! This year’s AIS was another enjoyable highlight of the year. 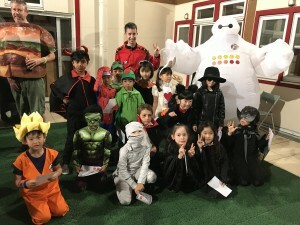 To celebrate cultural diversity as an international school, this year Grades 2-6 on the second floor put in a wonderful effort to introduce other fall festivals from around the world. 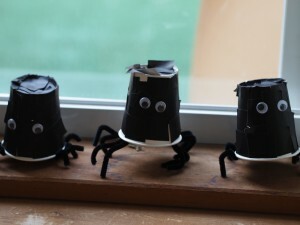 Downstairs in Grade 1 and the kindergarten was typical Halloween spookiness. Learning and having fun at the same time. 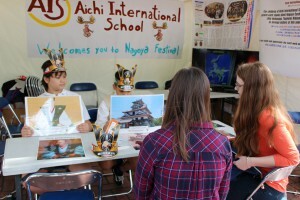 AIS set up a booth at this year’s Nagoya Festival. 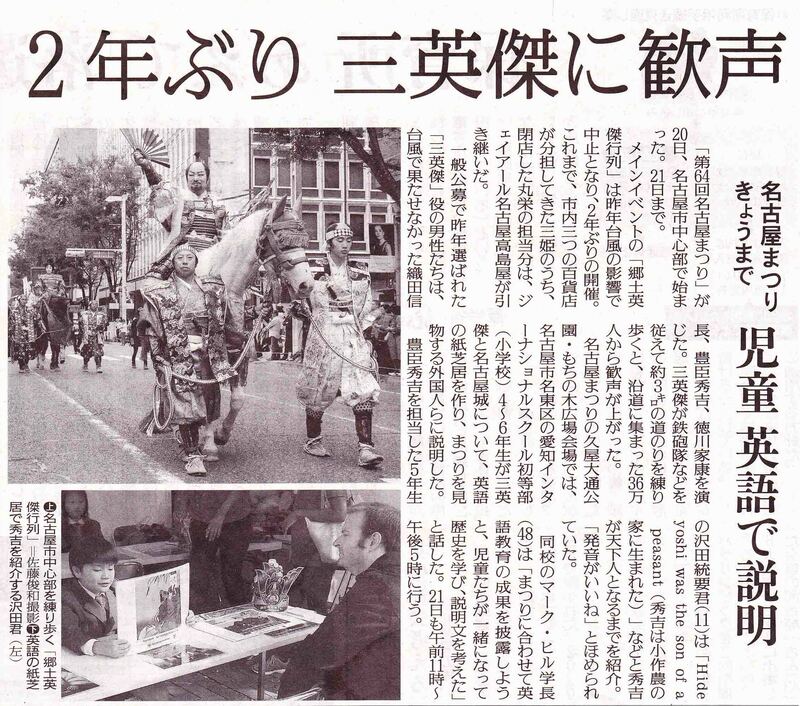 Children from Grades 4-6 presented picture-board stories about Nagoya Castle and the three local heroes (Oda Nobunaga, Toyotomi Hideyoshi, Tokugawa Ieyasu) in English to visitors from abroad and Japan. Thank you for your kind support.